This portion of the Lotte Lehmann League site holds information about Gary Hickling, the art song aficionado and Lehmann expert. Gary’s connection to Lehmann and his background with his proud moments and “one-offs” are also accessible. You can find the archive of his radio programs, Singing and other Sins and other aspects of his delight in the world of art song, by going to the Art Song portion of this site. The other person presented on this site is his partner, Dennis Moore, composer, artist, pianist. Select Page 1 or Page 2 to view Mr. Moore’s “Digital Designs”. 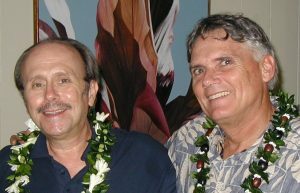 On his home page you’ll find photos from the opening of a Honolulu gallery presentation of his work, listen to the piece he wrote for solo double bass as performed by Gary, as well as hear him as pianist to Gary’s singing. You can view the 21 December 2013 wedding photos and video of Gary and Dennis.